These were well organised Championships blessed with good weather and racing. The only downside was a weed problem which the course staff resolved out of racing hours. The new LED scoreboard was appreciated and allowed video of racing to be displayed. The course maintained its status as the best course in Australia. The locals regarded this regatta as the best ever. 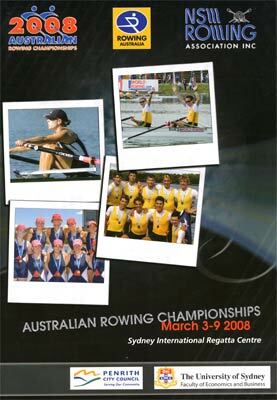 This may be true but others believed their view was coloured by the success of their crews and being awarded the Rowing Australia Cup as overall winners of the Interstate Regatta. Organising Committee: Charles Bartlett (Chairman), Andrew Rowley, Norma Perry, David Evans, Adam Horner (RA). This race was superb in every respect. The West Australians left the field for dead in the first 500 metres and maintained a diminishing lead through to the last 500 metres. New South Wales led the fight back getting to within 0.6 seconds with 500 metres to go. Into the last 500 metres New South Wales broke through WA who had spent their money. Then the steam train, otherwise known as the Victorians, started their run home. They passed the boys from the West in the last 250 metres, then went after New South Wales, and nearly caught them. 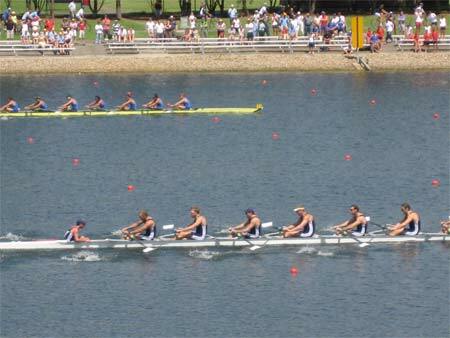 The New South Welshmen raced their race to perfection and came home victorious in a great and fast finish. Dan Noonan swept all great scullers before him in a start to finish win. Duncan Free stayed with Daniel in the first part of the race and then drifted into third place. Perhaps he thought that the Queenslanders were a good chance in the eight and saved himself? Chris Morgan started slowly being last after the first 500m but came back well in the second 500 m. He was unable to catch the strong sculling of Dan Noonan. There were no surprises in these results with Western Australia taking a start to finish win from Tasmania. This was a start to finish win for the Victorians who won well and strongly. New South Wales tried valiantly to stay with the Victorians for 3/4 of the race and were overhauled by Queenlsand in the final 500 m. The Queenslanders came home in terrific style and in a very fast last 500m. This was perhaps the most devasting win in this event ever. A margin of 12.56 seconds in such a race is unheard of and worthy of great acclaim. The Victorian crew took 2-3 seconds per 500m off the other crews and then hammered home a sensational last 500m 4.5 seconds faster than all other crews. It was awesome. Pippa Savage proved again that she was Australia's number one sculler with a convincing win from start to finish. This result was not in doubt with the favourites South Australia winning well even though Tasmania got the better of them in the first 500m. 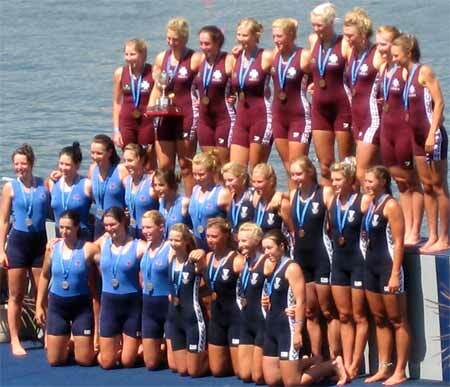 The Queensland crew did not have the race all their own way. New South Wales made a good race of it throughout.